In making square angles, all new beginners and all third-rate men bend in the vise, but as a rule the wise smith is not much of a smith. 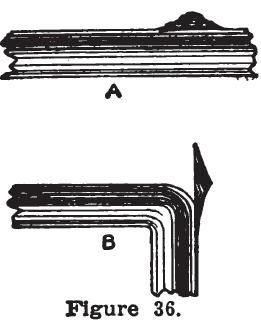 If the piece to be bent is common American iron, it makes a very poor job to bend in the vise, for this reason: that the sharp corner of the jaw will make a very sharp angle, and is liable to break under a heavy strain. It is important that no work be bent in the vise, especially if poor iron. Bend the material over the anvil. The helper holds the sledge as shown in Fig. 34. 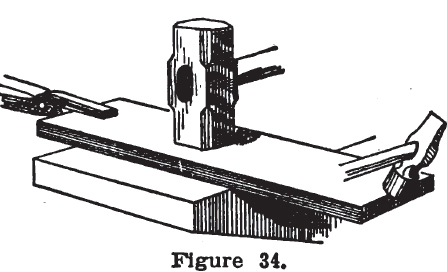 When the piece is bent, work it down to square on the inside by striking on the outside, while the iron is so held that it does not rest with the corner against the anvil. The angle cannot be worked to a square corner on the outside unless the material was heavier over the bend. This is a piece of work to do that must be done right, or it will neither look good nor will it be strong. If an attempt is made to work the angle until it is square on both sides, there will be a deep crack in the square on the inner side, and this will render the work useless. See Fig. 35A. If a square angle on both sides is desired, there are two ways of working: First, to upset the iron on the bend (See A, Fig. 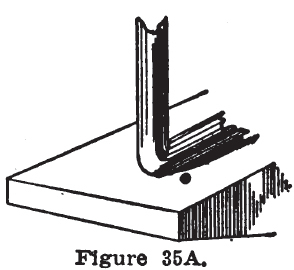 36); but as this cannot be done in all cases, another and a very easy method to pursue is to bend the angle, and work it square on the inside; then make a wedge, and cut in for it in the stock next to the corner; weld this wedge in and work it out to a square. The wedge should be tapered at both ends. See Fig. 36B.